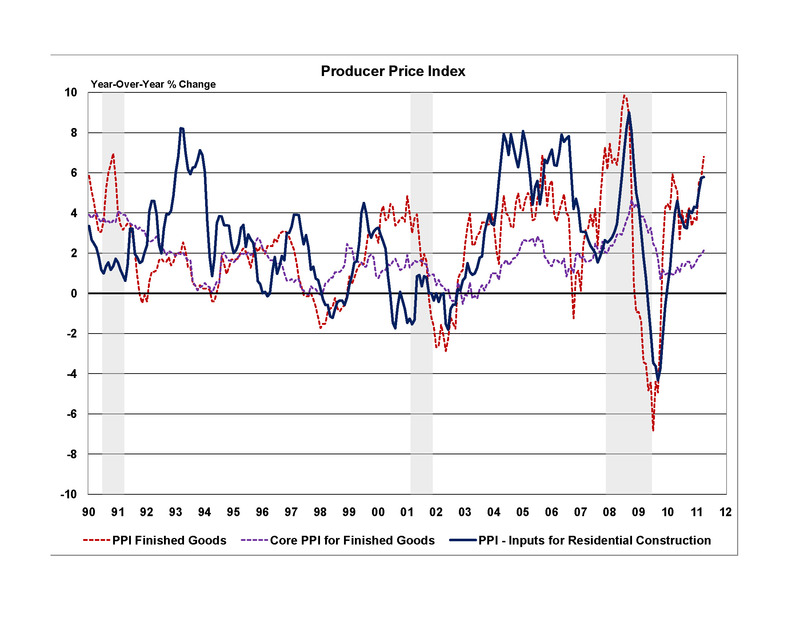 The Producer Price Index continued to march up in April as energy prices sustained their strong growth. The Bureau of Labor Statistics release of the Producer Price Index (PPI) reported that the PPI for finished goods rose a further 0.8% (SA) in April, the tenth consecutive monthly increase. Over the past year, the price of finished goods has advanced 6.8% (NSA). Core PPI, a more stable indicator of producer prices, as it excludes the volatile food and energy prices, rose a moderate 0.3% in April. This is the fifth straight rise in the core PPI in recent months. Overall, Core CPI is up 1.5% since November and 2.1% year-over-year. Rising energy prices accounted around three quarters of the increase in the PPI for finished goods in April, with the finished energy goods index up a further 2.5% (SA). Gasoline prices contributed over half of this rise in the energy index, climbing a further 3.6% (SA). The gasoline price has risen 38.8% in the past year. Liquefied petroleum gas (up 4.5%) and residential natural gas (up 3.5%) were also factors in the increase in the finished energy goods index. The composite index of inputs into residential construction rose 1.1% (NSA) in April and is up 5.8% year-over-year. Energy prices continue to dominate the composite index, with regular gasoline rising 9.0%, petroleum refineries increasing 6.1% and #2 diesel fuel up 5.7%. A moderate rise was also observed in the prices of products with uses outside the building industry, including copper and copper products (2.0%), steel mill products (2.2%), plywood (1.6%), as the global economic recovery gathers momentum. Gypsum prices dropped 4.9% in April, giving back most of the 7% increase in March, and lumber prices fell 1.1%. Most other building materials experienced either a modest decline or slight rise, reflecting the weak demand from the struggling housing sector. Energy prices appear to have reached their peak in April, with the price of West Texas Intermediate falling back below $100 per barrel in the first week of May, from $113 per barrel in the last week of April. However, relief from high energy prices is unlikely in the near term, with the price of WTI creeping back above $100 per barrel in the second week of May. We expect the price of WTI to remain relatively stable around $100 per barrel through the remainder of 2011. Thus, while energy prices will no longer be pushing the PPI higher, they will not support an easing of producer prices either.